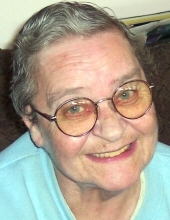 Margaret A. Hinz, 81, of Batavia passed away peacefully on Sunday March 31, 2019 at the Premier Genesee Nursing Home surrounded by her family. She was born on February 3, 1938 in Batavia to the late Charles and Bessie (Fenton) Johnston. In addition to her parents, Margaret is predeceased by her son; Freddy Hinz; brothers Allen, Billy, Bobby and Jimmy Johnston; sisters Marion Kaziorik, Mary Lyons, Virginia Geyser and Nancy Wade. Margaret was a long time employee at PW Minor in Batavia. She loved fishing, puzzles and Beanie Babies. She enjoyed camping and the outdoors and loved wildlife. Margaret just loved life. She will forever be remembered as a devoted wife, mother, grandmother and great-grandmother. She is survived by her beloved husband of over 60 years; Larry Hinz Sr.; children Margaret (Michael) Taylor of LeRoy, Larry (Patricia) Hinz Jr. of Batavia and Roxanne (Michael) Sentiff of Brockport; 6 grandchildren, 4 great-grandchildren along with many nieces and nephews. Family and friends are invited to call on Thursday April 4, 2019 from 4:00-7:00PM at Gilmartin Funeral Home & Cremation Company, Inc. 329-333 West Main Street Batavia, New York 14020. A 10:00AM Funeral Service will be held on Friday April 5th at the Funeral Home. She will be laid to rest in Mt. Pleasant Cemetery in Alexander. In lieu of flowers, memorials may be made to the Alexander Fire Dept. PO Box 336, Alexander, NY 14005. For more information please call 585-343-8260 or to leave a message of condolence please visit www.gilmartinfuneralhome.com. Arrangements completed by Gilmartin Funeral Home & Cremation Company, Inc. 329-333 West Main Street Batavia, New York 14020. To send flowers or a remembrance gift to the family of Margaret A. Hinz, please visit our Tribute Store. "Email Address" would like to share the life celebration of Margaret A. Hinz. Click on the "link" to go to share a favorite memory or leave a condolence message for the family.